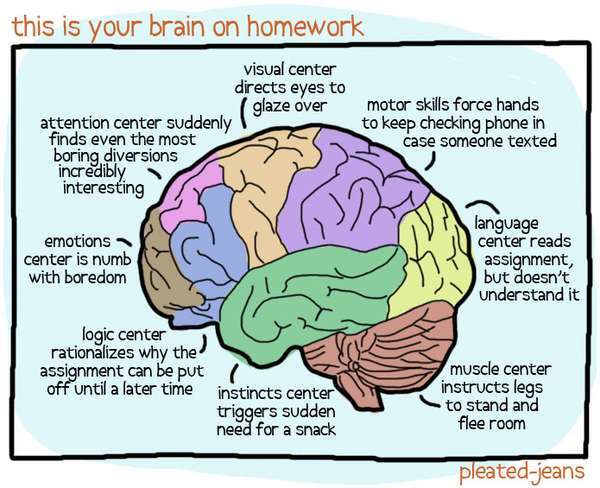 While doing homework our brains are busy performing all their normal functions. And also some that dont seem so normal. While we expect our brain to perform the expected tast, homework, it often does what it wants instead. Suddenly your eyes won't focus on the task. Then you feel a strong desire to have a snack. Since you cant seem to concentrate you might as well stand up, stretch your legs, check your phone, and of course get that snack. Now that your brain has sabotaged your efforts to complete your homework, you figure you'll do it later, since it was incredibly boring anyway.